In its press statement on October 3, the Indonesian Workers and Labourers Assembly (MPBI) stated that 2 million workers mobilized for the national strike it called for that date, with mobilisations in industrial areas or outside government offices in 21 cities and towns. Press and various blog reports separately estimate hundreds of thousands of workers mobilized in Jakarta’s various industrial estate areas, gathering at many different rally points. 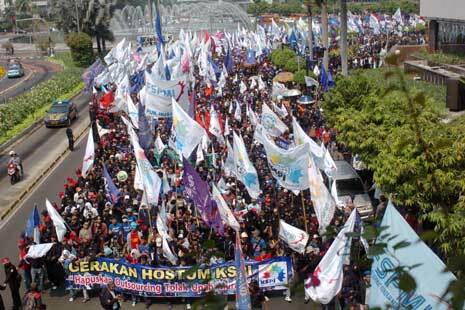 It is reported that tens of thousands of others gathered in Indonesia’s larger cities and thousands in smaller towns. The strike was scheduled to go for a few more days but the MPBI leadership called it off after one day, following another round of meetings with the Minister for Labour. The MPBI has given the government two weeks to come up with a satisfactory answer to its demands, or the strike will resume. The demands articulated by the MPBI, and supported by other unions outside this formation, including the more overtly left, but much smaller, Workers Secretariat, are for an increase in wages, and end to “outsourcing” and the full implementation of health insurance legislation which would guarantee coverage to all workers, with employers paying the premiums. However many exactly mobilized, the strike marks a clear turning point in the shaping of the political terrain for popular struggle in Indonesia. Labor, even if still only a miniscule portion of the workforce is organized, has entered the political stage and this entrance is based on the increased self-confidence and combativity of workers, especially in the industrial estate areas. These areas, where factories are jammed in beside each other and tens of thousands of workers swarm to their workplaces every morning, have been the centre of labour militancy since the 1990s, when still under the Suharto dictatorship. In the 1990s, garment, footwear and textile workers played a leading role. Now workers in the large plants assembling cars, motor bikes and white goods are playing a leading role. As these sectors “boom”, the bargaining position of the unions, which have re-organised in the more liberal atmosphere since the fall of Suharto, is providing the material base for the increased self-confidence. However, such a boost in confidence – and combativity – cannot be a simple mechanistic product of the new political economy of manufacturing. An article by Peoples Liberation Party (PPR) activist on the Pembebasan (Liberation) website quotes a workers’ movement activist, Budi Wardoyo, as giving three reasons for what they term “radikalisasi” – I think, better described as increased combativity. These are: the inspiration of a long strike by workers at the Freeport mine in West Papua for better wages which achieved positive outcomes although other activists think the strikes across Java have beenmore important in inspiring combativeness; the success of the campaign by the Social Security Action Committee (KASJ), a coalition of NGOs and unions, in winning health insurance legislation in 2011, and the success of the protest movement in May 2012 which succeeded in forcing the government to delay an increase in petrol and kerosene prices. Union-led worker mobilisations were crucial to all these campaigns. It is clear also that conscious propagandizing for more militant and solidarising activities among the workers and careful tactical planning has also been crucial in this process – preceding even the Freeport strike. 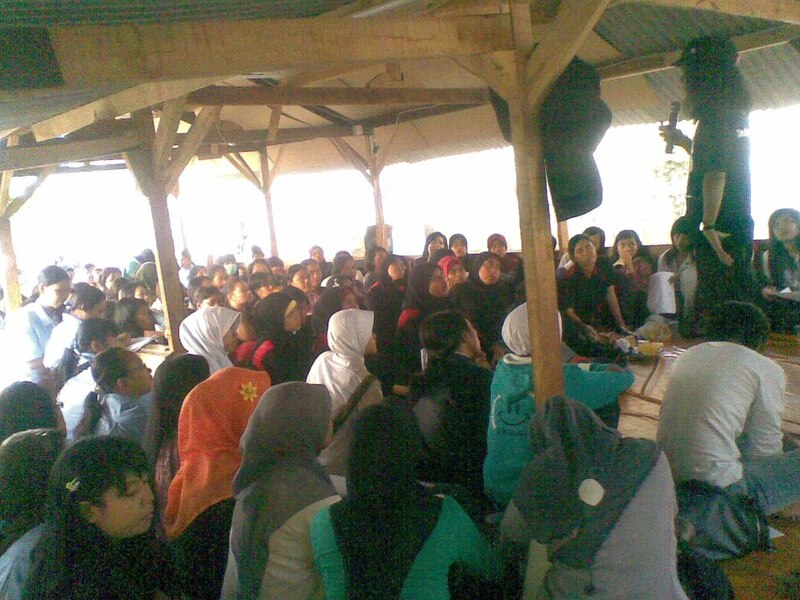 This education and planning seems to have been initiated from within the Federation of Indonesian Metal Workers’ Unions (FSPMI). An article entitled Rachmat, Tarikh (Sejarah), Hidayah dan Rekomendasi (Positive Results of the Struggle: Histiry, Lessons and Recommendations): by Danial Indrakusuma throws some light on these processes. Indrakusuma was a co-editor of the first left magazine of the late Suharto era, Progres until it was banned in 1992 and one of the founders of the Peoples’ Democratic Party (PRD) at about the same time. He left the PRD not long before the expulsion of the those in PRD in 2007, opposed to the rightward drift under the then Dita Sari leadership. Indrakusuma was also a critic of this direction. Sari is now a spokesperson for the Minister of Labor in the Yudhoyhono government and has been campaigning to convince workers not to strike. 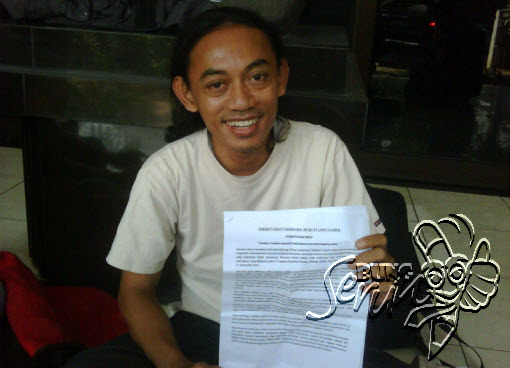 Indrakusuma worked with others expelled from the PRD to form what is now the Peoples Liberation Party (PPR). However, he has been active outside the party for the last two years as a teacher of economics and politics for members of the FSPMI. He has become a popular figure among many workers who have been in his classes or read his ideas on union tactics. Since 2011 (at least) he has publicly advocated for a new workers’ party. HOSTUM is the name of the union0-NGO coalition campaigning against outsourcing. In his article, he explains the factors that he thinks have lead to the increased workers’ self-confidence. In some ways he echos, Budi Wardoyo’s three points, however also points to the internal processes inside the FPSMI and other unions. Among these were the workers involvement in research and seminar activities carried out in conjunction with research-oriented NGOs. This deepened workers’ understanding of the wages system and, more crucially, the extent of ‘outsourcing’ and the gap between the current outsourcing situation and even existing legislation. According to Indrakusuma, almost 80% of workers carrying out central work in the country’s major plants were “outsourced” workers, i.e. workers with basically a casual status. Outsourcing, it was revealed, was not a “supplementary” form of employment but the situation of the vast majority of the factory workforce. This, says Indrakasuma, has been the basis for the successful “gerunduk” tactic where workers from one or more factories will rally outside other factories calling on those inside also to stop-work. The fact that almost all workers everywhere are casual and have an interest in opposing “outsourcing” provides the basis for practical solidarity. Solidarity actions between workers in different factories, and between unions, have forced some employers to transfer workers on to a permanent basis, as provided by law. Thousands of workers have achieved permanency. The law on outsourcing restricts it to only supplementary work and work of a temporary nature. The unions are opposing all kinds of outsourcing. Indrakusuma’s article also depicts a process where there has been a conscious attempts improving the quality of mobilisations. The steps have included: encouragement of workers to attend the pickets and protests of other unions and factories; involvement in issues not directly related to the employer but to government and parliament, such as the social insurance law; and stop-works that spread through a whole industrial enclave and close it down. The most significant of these was the January 2012 stop-work and rally by 200,000 workers in several industrial enclaves on the eastern edge of Jakarta, in West Java province. There has also been, says Indrakusma, a policy of encouraging “rapat akbar” (mass meetings, though the Indonesian term conjures up the vision of the great anti-colonial mass meetings of before independence), These discuss strategy and tactics as well as being a means of showing support for demands on the government. The greatest success in this area was the May Day rally organized by the MPBI (at its forming) in the main Jakarta sports stadium, with at least 60,000 workers present. Indrakusuma also goes into detail of specific struggles in different factories that he considers have had an important impact. The article also points to the confidence building presence of the Garda Metal (Metal Guard), a disciplined formation of the more physically prepared workers, that often lead mobilisations and provide a sense of security. There is always a strong police, and sometimes military, presence at demonstrations. 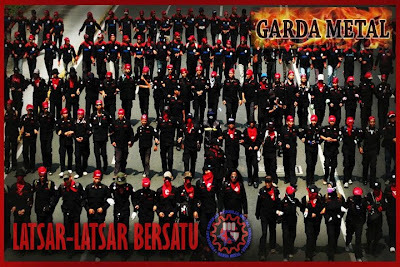 Watching any of the You Tube footage of the October 3 mobilisations (search mogok nasional or mogok MONAS), one can only be incredibly inspired by these developments. The rapat akbar rallies, the mass stop-works, the mobilisations shutting down whole enclaves and the raising of the spectre of a political challenge to the government – the emergence of organized labor as an organized political actor – may very well be a turning point. The most important political consciousness that has grown alongside all these struggles is that these affairs of labor cannot be resolved outside of politics, outside of the struggle for power. It is that consciousness which pushes as to control the state. The other important political consciousness that has grown is that workers (buruh/labourers) must be the vanguard in the struggle for the interest of the [whole] people, not just for the workers, especially as we need the votes of the people in elections as well as their political support (in the sense of mass support). There are, of course, many issues involved here relating to the nature of the state and whether it can be ‘controlled’ or whether it has to be dismantled and rebuilt. However, no doubt, this issue will get elaborated further as time goes on, including by Indrakusuma, who has been part of the radical left since its emergence in the late 1980s. In the next paragraph, he also points to a weakness of the process so far: the fact that unity with the left wing unions – those with an overt radical left political perspective – has not yet been achieved; something which he says was a key to the success of the labor movement in Brazil. Left wing unions, organized in the Workers Secretariat, and where the PPR as well as at least two other left political groups, perhaps more, have some presence, also participated in the October 3 strike, but mobilizing separately “meeting in the field”. The fact that the Yudhoyono government resumed negotiations with MPBI leaders on the day of the strike indicates they are sensitive to the threat that any ongoing worker protest momentum represents, especially to immediate commercial interests. Employer groups were squealing from one end of the country to the other in the lead-up to and on the day of the strike. While editorials were often hostile to the strike, working journalists reports were generally sympathetic. The government is hard-pressed to justify a situation where almost all bosses are employing “outsourced” workers illegally. This is harder when the ruling party, and most of the state apparatus is constantly embroiled in corruption cased revealing huge sums of money changing hands. The Minister for Economic Affairs, Hatta Rajasa, came out of the strike apparently supporting the wage increase being asked for by the unions (from about the current $200 per month to around $250). The first next test will be whether the government comes up with compromises – they will surely be compromises – which will still satisfy the union leaderships. In that sense, it will be a sense of the depth of commitment of the union leaders to winning these demands, and to the rhetoric about struggling towards a workers’ government. The emergence of this labor factor is likely to impact also in electoral politics. While there are occasional whispers of a new party emerging – a socialist workers party – there are no visible moves in that direction yet, and it would require a quite huge convulsion for such a party to be able to register and participate in the 2014 elections as registration of parties has already closed. The more immediate issue may be in relation to elections to be held soon for the governorship of West Java. All of the industrial estate areas on the outskirts of Jakarta are a part of the province of West Java. One person who has said she wants to stand as a candidate is Rieke Diah Pitaloka. She is a member of parliament for the Indonesian Democratic Party of Struggle (PDI-P) and has developed popularity among the factory worker population because of her consistent support for the Social Insurance legislation for which KASJ campaigned. She spoke at many union rallies as part of that campaign, as well as supporting wage campaigns. Some say that she has her own support base inside the FSPMI. There are recent news reports that she wants to stand with veteran anti-corruption, human rights campaigner and NGO figure, Teten Masduki as her deputy. It is not impossible that the PDI-P may agree to this (although there are rival candidates seeking party endorsement), especially given the success of the PDIP’s feint to populism in the Jakarta Gubernerial elections where their candidate, former Solo city mayor, Joko Widodo, defeated the incumbent, who was supported by the ruling national coalition around President Yudhoyono. Megawati Sukarnoputri has been touring the country with Widodo and saying that she wants to have a more ‘ideological’ opposition. (Having provided a platform for the militarist led GERINDRA party, of general Prabowo, by running for the Jakarta governership in alliance with GERINDRA, some in the PDIP are now trying to distance themselves from him.) A Pitaloka-Mazduki campaign for governor might fit the bill for Megawati at this point and it would likely to attract support from workers in the area. Meanwhile, it is very unlikely that the new combativeness of the working class won’t spread or that, as it spreads, that it won’t push forward the prospects of a serious political radicalization as well as pressure for the building of a workers’ and peoples’ party. Apart from the hints of that immediate desire among workers involved in the current strikes, there are at least five other pre-party formations all with that kind of stated goal. Danial Indrakusuma speaking at one of his economics politics classes. Karena mengenai masalah besar di Indonesia dewasa ini. Pemogokan yang berskala begitu luas dlakukan oleh kaum buruh Indonesaia . .